(a) Z – Axis. 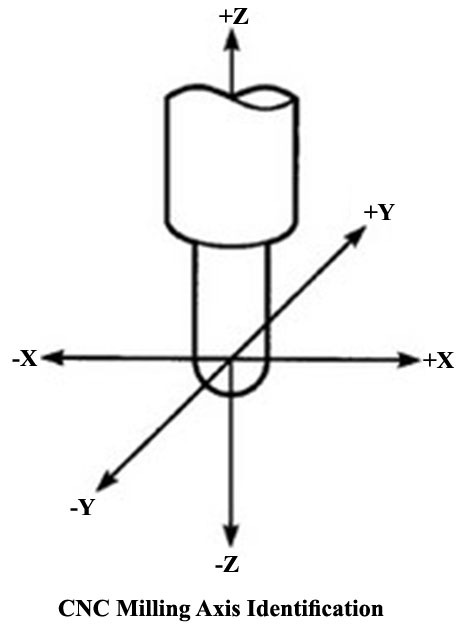 The Z-axis of motion is always the axis of the main spindle of the machine. It does not matter whether the spindle carries the work piece or the cutting tool. If there are several spindles on a machine, one spindle is selected as the principle spindle and its axis is then considered to be Z axis. On vertical machining centre, the Z- axis is vertical and on horizontal machining centres and turning centres, the Z- axis is horizontal Positive Z movement (+Z) is in direction that increases the distance between the work piece and the tool. (b) X – Axis. The X axis is always horizontal and is always parallel to the work holding surface. 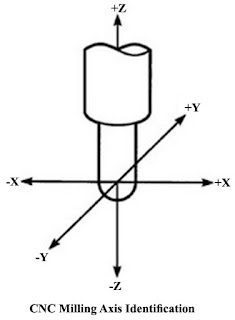 If the Z axis is vertical, as in vertical milling machine, positive X axis (+X) movement identified as being right, when looking from the spindle towards its supporting column. If Z-axis is also horizontal as in turning centres, positive X- axis motion is to the right, when looking from the spindle towards the work piece. (c) Y – Axis. The Y axis is always at right angles to both the x-axis and Z-axis. Positive Y axis movement (+Y) is always such as to complete the standard 3-diemensional co-ordinate system. (d) Rotary axis. The rotary motion about the X, Y and Z axis are identified by A, B, C respectively. Clockwise rotation is designated positive movement and counter clockwise rotation as negative movement. Positive rotation looking +X, +Y and +Z direction respectively. Hi there. What does 'always parallel to the work holding surface.' mean? Thanks!